Happy Martin Luther King, Jr. Day! To tell you the truth, I never understood why schools get this day off. Shouldn't we reserve this day to learn about the legacy of Dr. King? Instead, we've relegated it to a bank holiday. Just another day to sleep in. I'm not entirely sure that jives with Dr. King's dream, but whatever. Speaking of Dr. King, my friend Kaitlin and I had the pleasure of going to the Kadir Nelson event at Nicola's Books in Ann Arbor on Friday night and it was awe-inspiring. He is such a wonderful role model for young people to look up to, imploring the importance of following your dream instead of what will make you the most money. Check out my recap of the Kadir Nelson event. Truth be told, I didn't really do much reading this past week. I did start a new audiobook, The Wright 3 by Blue Balliett, but other than that, my reading is kind of at a standstill at the moment. I hate when life gets in the way of my reading. I HATE when life gets in the way of my reading! This must be like the fourth or fifth time that I saw I have a dream this week - like I said in my earlier comment, it looks like a book that's bound to receive sooo many awards. 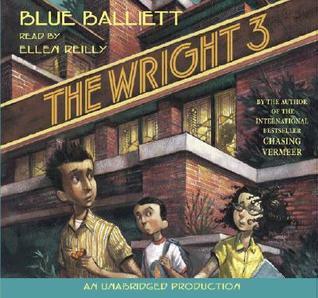 I think I have several Blue Balliett The Wright titles in my own bookshelves but I haven't gotten around to reading any of them yet. Have a great reading week! Love the I Have a Dream book. I shared it with a first grade teacher on Friday. Her class can't wait to hear a little of the speech (included on a CD with the book). I didn't get to rea as much as I would have liked either. Lucky you going to see Kadir Nelson! That must have been awesome. Hope your kids are enjoying Wonder. I may need a slow reading week soon! I've been reading so much my head may explode. 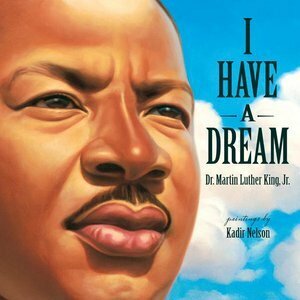 I loved the I Have a Dream book - amazing paintings to accompany a wonderful speech. Wishing you lots of happy reading this week!